I know lots of people hate double denim but I just love it, this skirt/shirt combo was one of my favourites in the summer and while I don't think it looks as good with tights as it does with tanned legs and Dicker boots I think it works for the colder weather too. I love all the blues in this outfit as well, makes a small change to my usual all black gloominess. Although this skirt is definitely too snug and short, I need a bigger size but they've sold out online :'( the only one I've seen that comes close is from American Apparel but I'd be too annoyed to pay crazy money when mine only cost about £15. But we'll see, I'm currently making the most of all the extra food that comes along at Christmas time (a perk of having CF!) and once I've totally grown out of this skirt I'll definitely miss it so maybe I'll have to be a mug and pay for the overpriced one. Talking of festivities tonight is my work's Christmas do, I have to leave in an hour and I don't have a clue what to wear! You have to look a little smart but not too dressed up, this is confusing to me! Have you had your work's thing yet? What did you/are you wearing? P.S. I'd really appreciate it if you'd take 5 minutes to read this...although I'm not in the exact situation yet, I can really relate to so much of what is said. Lots of love to Holly! Love that shirt and it looks really cool with your jacket! <3 Urgh, I hate planning what to wear for work smart/casual type things.. it's always a mine field! Its a shame you can't find another skirt like that, I agree American Apparel are expensive with some items. A black dress for your work's xmas do? Sorry not to be any help lol, xoxo. My work doesn't have a do for it's weekend employees, unfortunately :( They even asked me to work xmas eve without 1 and a half pay ha. We Canadians love double denim, hence the Canadian tuxedo....mwahaha! Double denim can look really good as long as it's not matchy matchy. I find a dress topped with a blazer or jacket is usually appropriate for work functions. Hope you had a great time at your work Christmas party. I went to myy husbands on the weekend. I've got mine at the end of the week. It is so hard to know what to wear, even more than usual. A friend and I are thinking of coordinating outfits and both wearing red dresses. Love the outfit! Where is your work's do? Gorgeous outfit, I'm the same- sometimes I can't stand double denim, but here it works so well! The article was so moving, really hope Holly gets her transplant! You rock that double denim Josie! You're legs look amazing here! You're a doll. Gorgeous outfit. I really love blue on you and I think this is the first time i've seen a royal blue on you. Big fan! You make double denim look better than anything I have ever seen! So poised and chic. 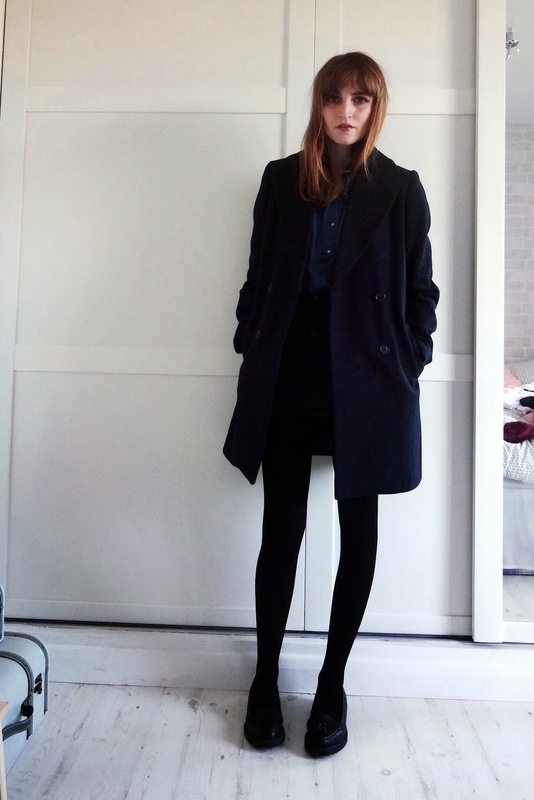 Love this outfit, And for not knowing what to wear you could never go wrong with a cute and a pair of tights.